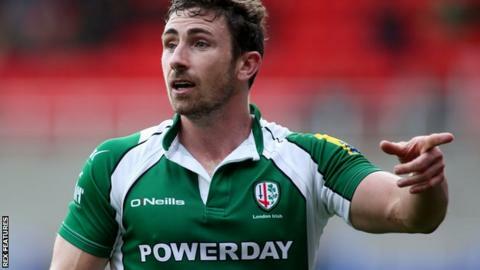 London Irish scrum-half Brendan McKibbin admits he was attracted to the club by its ambition to improve. McKibbin was one of the new arrivals at The Exiles during the summer, alongside new head coach Tom Coventry. The Australian, 30, made his full London Irish debut in his side's 16-28 defeat against Leicester on Sunday. "The club's been sitting low down the table for a number of years. There's an ambition to change that and create something new," he told BBC Sport. The Scotland-born former NSW Waratahs half back agreed his move to Irish back in January. "I wanted to be a part of that change," he added. "There's some great players and coaches who have come to the club and the structure's really good at the moment." McKibbin is one of five scrum-halves in Coventry's squad and is thrilled with the competition for places. "It's been really strong throughout pre-season and I think it will continue to grow throughout the season. "It's a long, gruelling season so I think you'll see some rotation there." Irish travel to Exeter on Saturday to face a Chiefs side who are also looking for their first win of the season. "They were quite unlucky against Bath not to win their first game," McKibbin added. "They play a good high-line defence and don't leak too many points. "We're going to have to focus on that and have a few tricks up our sleeve."